Healthy eating isn’t just about sticking to your five a day and not having too many sweets or soft drinks or how many calories in your meal. You should be looking at making sure your plate has all the right foods and the right amount of them. You have healthy hair, teeth, nails and skin. You get this from the nutrients and minerals in your food and drink. Coupled with exercise, healthy eating can also help to improve your mood and stress. The tips below are great ahead of exams too. Avoid foods high in sugar and salt – most food packaging uses traffic light labelling for their nutritional information. You should aim to eat minimal amounts of the amber foods and avoid those that are red. Getting your 10 a day - the rule of thumb is one portion is about one handful. Are you on track to reach your five-a-day today? If not, why not grab a healthy snack when you next have a sugar craving. Aim for a healthy plate– it’s easy to fill up plates with the foods we enjoy but to get the most for each meal, you should not only aim for a rainbow of colours but also make sure your portion sizes are right. Avoid gimmicks and fad diets – Not only are your bodies are still growing and developing, you will also be going through many emotional changes and academic pressures. This is why it’s important to make sure you’re eating enough, eating fresh foods and also enjoying what you eat knowing it’s the fuel your body needs. Unless your doctor advises you, or are unable to eat certain foods because of allergies or religion reasons, you should not be going on any special diets. 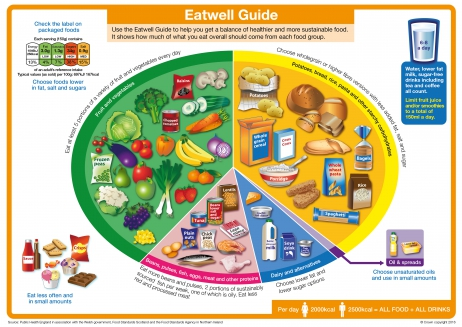 The NHS Eating Well Guide is a great resource to see what types of foods you should be eating. If that gets you in the mood to cook up a healthy meal or two for you and your family or friends, you can visit the Change4life website which has recipe ideas, tips for staying active and lots more information about healthy eating.